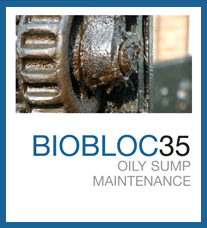 Add BIOBLOC 35 directly to the lift station or oily sump. When locating the BIOBLOC 35 in the sump, do not place BIOBLOC 35 directly into the flow of incoming wastes. The turbulence and “washing effect” will greatly reduce the longevity of this product. Ideally, BIOBLOC 35 should be placed in a less turbulent area of the sump, but not in a dead spot. BIOBLOC 35 should be suspended in the sump so that it is always submerged in water, even at the lowest water level. This will assure maximum contact time with the organics providing superior results. If a grease shelf is present during placement of BIOBLOC 35, it is recommended to raise the high level flow so that the bacteria can attack the grease shelf from the top, bottom and sides. Results should be obtained in four to eight weeks from the time of application. If grease shelves are present at the time of application, a longer period of time may be required to obtain results. Dosage rate vary with flow rates, retention times and oil accumulation. This rate is for a typical industrial sump or pit.